There are two coronary arteries, the left and the right. Both arise from their respective aortic sinuses shortly after the aortic valve and supply the myocardium with oxygenated blood, principally in diastole. The left coronary artery, as the left main stem, divides early in its course to form the left anterior descending artery (LAD) and the circumflex (Cx) arteries. The LAD gives off diagonal branches to the lateral wall and septal branches to the anteroseptal portion of the heart, which are typically represented on the surface ECG by leads V1-V4. The Cx gives off two or more major obtuse marginal branches and supplies the side and the back of the heart On ECG this is typically represented by leads V5, v6, I and aVL, though posterior changes are appreciated in the so-called anterior leads of V1-V4 (see the section on posterior MI for more detail). Posterior infarction can sometimes elude the capabilities of the basic ECG. Through the addition of three further chest leads continuing the path of the standard chest leads around the apex (V7, V8 and V9), ST elevation representing acute posterior MI may be demonstrated, which otherwise could be missed. The right coronary artery supplies the inferior border of the heart and is reflected in leads II, II and aVF. It gives off a number of small branches in its early course. Firstly, to the conus branch, which has little importance in a clinical setting. Next is the SA nodal artery branch which arises high off the RCA and therefore is not often affected by RCA ischaemia. Further downstream are the right ventricular and acute marginal branches which supply the right ventricle, accounting for why RV infarcts are associated with inferior MI. The AV nodal branch arises distally; compromise of this vessel is a frequent cause of complete heart block. The RCA divides into the posterior descending artery (PDA) to supply the most inferior border of the heart, and the left ventricular branch. Approximately 10-20% of people have their PDA arising from the Cx artery rather than the RCA. This is referred to as a dominant circumflex system and can mean inferior ST changes on ECG in association with circumflex ischaemia or infarction. 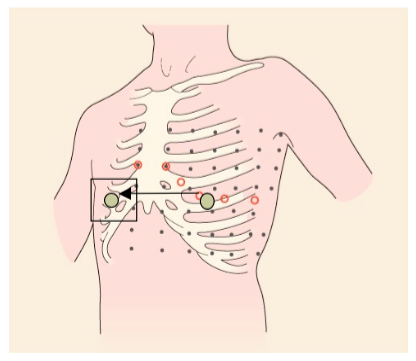 RV infarction is appreciated in two ways, either through ST elevation in leads V1 and aVR, or through an additional lead, which represents the mirror image of lead V4 placed on the right side of the sternum rather than the usual left. This is referred to as V4R. ST elevation of more than 1mm in this lead in the context of inferior STEMI indicates acute RV infarction. When myocardial oxygen demand outstrips supply, ischaemia occurs. After more than 30 minutes of ischaemia, infarction (death) of myocardium begins to happen. One of the prime goals of the management of cardiac chest pain is to prevent the reversible phenomenon of ischaemia leading to the irreversible phenomenon of cell death (infarction). The ECG is a crucial component in this process. Coronary ischaemia caused by a stenosis of one coronary artery is represented by acute depression of the ST segment in a territory corresponding with the anatomy of that artery. Global ST depression on the ECG usually represents a different phenomenon, one which affects the whole heart, such as the digitalis effect or profound anaemia. Because coronary occlusions causing infarction or ischaemia affect sections of the heart spanning multiple ECG leads, ST depression in one lead does not usually make sense, except in the very earliest of stages, or in the context of circumflex ischaemia, where the addition of further leads may show additional territories affected, which would otherwise be missed on the basic 12 lead ECG. In Figure 19, downsloping ST segments are seen in inferior leads – II, III and aVF. Note how the ST depression extends into the lateral chest leads as well. 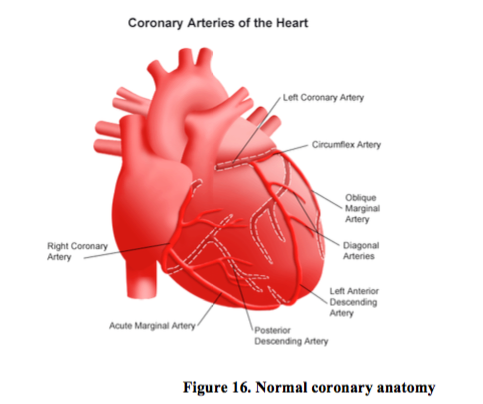 There is a large degree of variance in coronary anatomy. Some right coronary arteries extend around the inferior wall to supply part of the lateral wall. Alternatively, this could represent one of the 10-15% of people who have a dominant circumflex. It is important to note that leads I and aVL do not necessarily look at the same part of the heart as V5 and V6. The two look at the side of the heart from different positions and angles and so provide additive information. This gentleman went on to have coronary angiography and a large dominant right coronary was demonstrated with a 95% stenosis in the proximal course. This usually means the LAD artery is involved. ST depression anteriorly is seen on the ECG (leads V1-V4) but frequently extends right across the chest leads despite only involving the LAD. People vary in their anatomy, but perhaps more importantly, lead positions can vary depending on the person performing the ECG. It is always worth having a look at the sticker positions of any ECG handed to you to see if the they are spread across the precordium as they are meant to be. There may be marked fluctuation of any acute ischaemic change during the early phase of treatment as the artery constricts or dilates on the critical stenosis by subtle amounts that can cause a large effect. Sub-lingual GTN can magnify these minor changes. Posterior STEMI also causes deep ST depression in the same leads. However, the changes associated with posterior STEMI are usually progressive and smooth, whereas the changes associated with LAD ischaemia tend to be more dynamic. Equally, the history is telling. Persistent pain for 2 hours, with nausea, vomiting and sweating in association with deep anterior ST depression should make one think of posterior STEMI, as opposed to ten minutes of pain with variable ECGs. There will be more on this in the section on posterior MI. 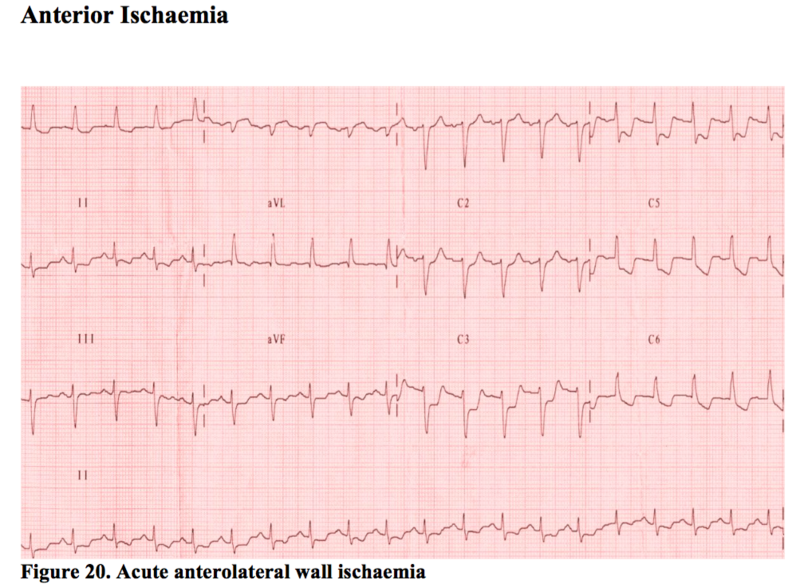 Isolated lateral ischaemia is the most difficult territory to be certain about. This is because of the problems posed by left ventricular hypertrophy (LVH). LVH can cause fixed repolarisation changes in the lateral ST segments – either ST depression, T wave inversion, or both (also known as the ‘strain’ pattern) which unfortunately isn’t usually as obvious as example shown in Figure 22. 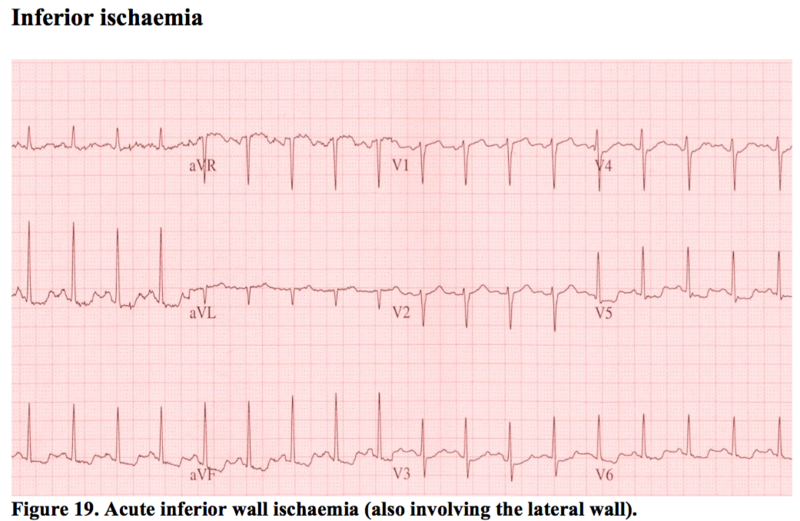 This is frequently mistaken for acute ischaemia by ECG computers and many clinicians, perhaps understandably so. Firstly, the important thing is to establish if the history if consistent with acute cardiac chest pain. If it is not, look for LVH on the ECG. One simple method is to add the height of the largest S wave out of V1 or V2 to the tallest R wave out of V5 or V6 and if it comes to more than 35mm, this fulfils one ECG criteria for LVH. There are many different formulae, but this is one of the few occasions where the ECG computers can usually be relied upon – they are very good at spotting the criteria for LVH. Of note, fulfilment of the ECG criteria does not definitively mean a person has a hypertrophied heart. People with a narrow anteroposterior diameter to their chest or just thin people can fulfil the criteria and yet still have normal thickness on echo. These subjects should not have abnormal T waves though. Abnormal T waves with ECG criteria for LVH should not be dismissed. Remember, people with LVH can also get acute lateral ischemia. This brings us to the key aspect of this problem. If someone has cardiac chest pain and ST depression, then whether or not LVH is present in the lateral leads, the patient should be treated with vasodilators, analgesia and B-Blockers where possible, with the ECG repeated after 10 minutes. The ST segments will usually vary, if only by a small amount, in the context of ischaemia, whereas the LVH associated changes will typically stay the same, as long as the leads are in the same, or at least prove disproportionately similar despite the resolution or progression of symptoms. Unfortunately, there is another catch. Variations in heart rate can cause ST segments to fluctuate with or without ischaemia in LVH. In the end, therefore, it is all about the patient in the bed. If they give a good story and the ECG has ST depression on it, treat them as ischaemic pain until someone else tells you otherwise. In reality, if the story is good, it takes a series of ECGs with no changes on them, plus or minus another test (such as an echo or troponin level) to establish certainty in some cases. Old ECGs are of course also very useful for spotting those with long-standing changes. An occluded right coronary artery is the usual cause of an inferior ST elevation MI, though in 10% or so of cases, the circumflex may be the culprit. ST elevation of more than 1mm two of leads II, III and aVF represents the conventional criteria for diagnosis, but it is important to realise that these are criteria established for the purposes of the administration of thrombolysis. The criteria were designed to avoid the unnecessary administration of thrombolysis to those without acute vessel occlusion. 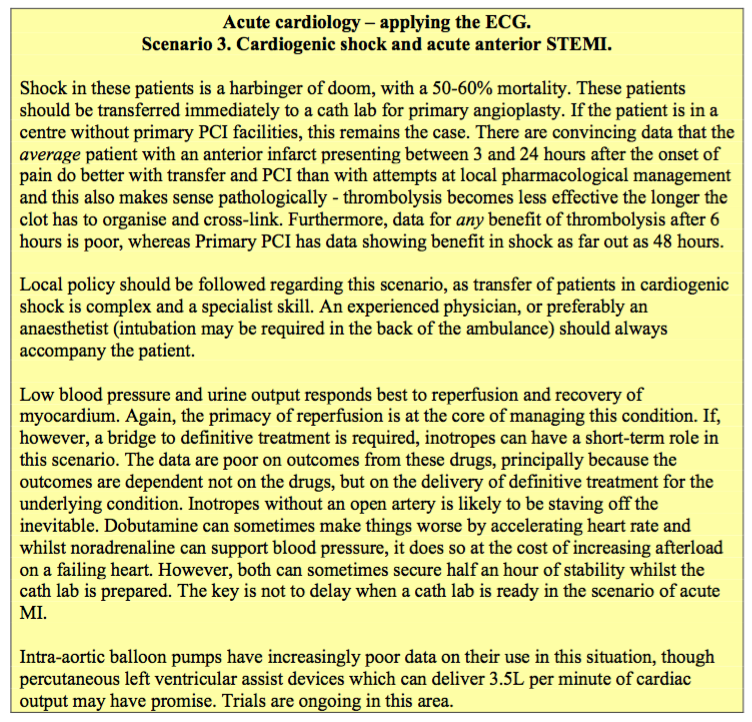 It is possible, therefore, to have an acute inferior STEMI without 1mm of ST elevation. Never forget the patient in front of you. If they are pale, sweaty, vomiting, with 3 hours of chest pain, yet their ECG shows only half a mm of inferior ST elevation, their vessel may be just as blocked as someone with 6mm of ST elevation. The ECG reveals three clues for those looking for RV infarction. Firstly, is there ST elevation in lead aVR? This is a common finding in ischaemic patients even with apparently normal RV function and so is the least reliable ECG sign in our experience. Next is ST elevation in V1, one of the few occasions where ST elevation in an apparently isolated lead has significance. Finally, transposing lead V4 to its mirror image on the right side of the chest may show ST elevation, indicating RV infarction. Any infarct can produce runs of sinus bradycardia and this is usually not a consequence of ischaemia to the SA node. Rather, this represents a vagally-mediated phenomenon, stimulated by infarcting myocardium. The right coronary artery gives off branches to the SA and AV nodes. The SA node arises from the most proximal component of the RCA and so is infrequently occluded. Nevertheless, proximal RCA occlusion may cause sinus arrest and produce a junctional rhythm in these patients. As a junctional rhythm comes from the AV node and this structure is heavily innervated by the parasympathetic nervous system, this usually responds well to atropine. This should only be done, however, in the context of hypotension, as the resultant tachycardia may induce more pain and present a small risk of extension of the infarct. The AV node is usually supplied by a branch of the RCA which arises more than half-way down the artery in most subjects and as a result is frequently occluded during acute MI. This may present as anything from first degree heart block to complete heart block. The AV node is remarkably resistant to this sort of injury, and even following prolonged interruption of blood supply can recover. Reperfusion is essential in the management of heart block in acute MI and therefore should be attempted as quickly as possible. Common mistakes and survival tips. Treating relatively asymptomatic bradycardias in the context of infarction can do more harm than good. Reperfusion of the heart is the best treatment for this, so use atropine and pacing judiciously. Treating the patient as unstable angina just because the ST segments don’t quite reach 1mm is a mistake. 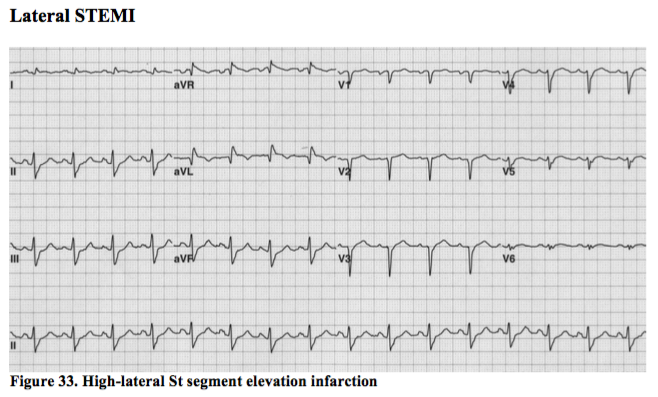 If the patient and the ECG look like they may be developing an inferior STEMI, seek immediate specialist help. Do not forget the right ventricle. 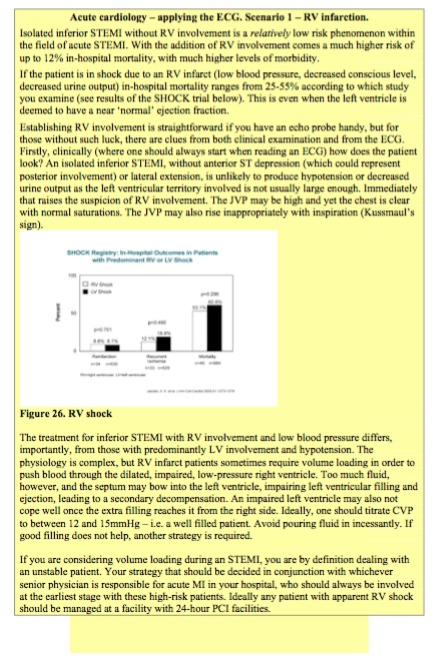 Low blood pressure plus inferior infarct should make you think of RV involvement and performing a right-sided ECG. Anterior STEMI has a relatively high in-hospital high mortality. It is more frequently associated with cardiogenic shock due to left ventricular failure and the problems of hypotension, pulmonary oedema, renal failure and high grade/high-risk conduction block present challenges to management. Early diagnosis and treatment is essential. In the example shown above, the patient presented after 4 hours and was unwell. The characteristic convex shape of the ST segment in acute MI suggest an acute problem, but the deep q waves and loss of R wave anteriorly detail the late presentation. The patient had ongoing pain though and was within the timeframe where reperfusion can still make a significant difference. They were taken straight to the cath lab for opening of a blocked LAD. 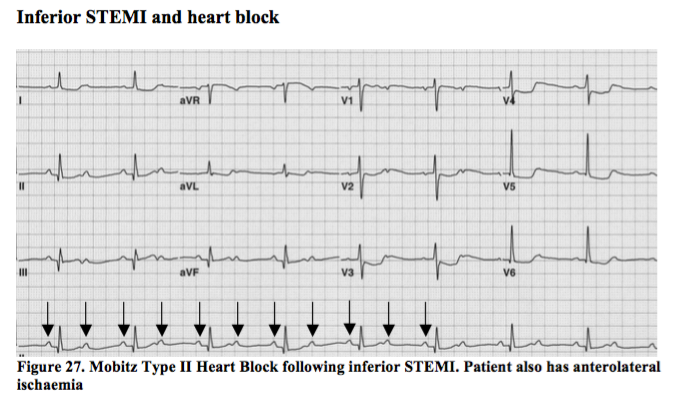 Identification of anterior STEMI has been traditionally through establishing 2mm of ST elevation in two contiguous (i.e. anatomically connecting) anterior leads. This was, though, the criterion for thrombolysis, not for establishing the diagnosis. It is important to recognise that the earliest phase of anterior STEMI, as with all STEMI, may be hyperacute T waves without ST elevation as seen below in V3 and V4. Note the loss of concavity in the ST segment from ECG 1 to ECG 2. 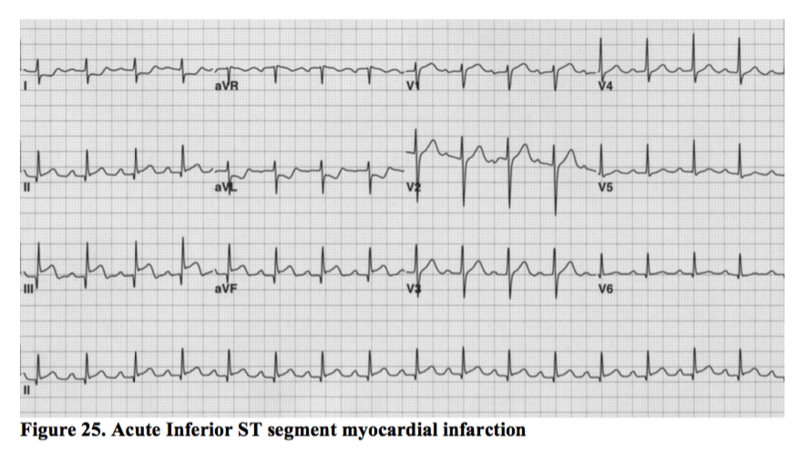 This ‘doming’ of the ST segment is an early sign of acute myocardial infarction and can be invaluable in differentiating a normal ECG from an infarcting one. This patient had severe central chest pain, looked unwell and required emergency management on arrival, not just a repeat ECG in 10 minutes looking for the ST elevation which did, ultimately, appear. In a scenario where infarction is suspected but not proven, seek an immediate specialist opinion. Other ECGs are commonly mistaken for anterior STEMI. The criteria were set higher at 2mm of ST elevation in the original thrombolysis studies partly to try and eliminate these errors, but sometimes it is not enough. Left bundle branch block is a common cause of ST elevation anteriorly. Of course, if a proximal LAD occlusion exists, this can infarct the left bundle branch, producing an acute MI, and is a high risk scenario. In the author’s experience, these patients tend to be sick. They are not usually chatting away without symptoms. Treat the patient with assistance from the ECG, not the other way around. Left ventricular hypertrophy is a frequent cause of incorrect diagnosis. Anterior ST elevation is a normal, permanent, finding on the ECGs of some people with LVH. Look for the loss of concavity in the ST segment, which may be your only clue to an acute infarct. Do not rely on this though. Serial ECGs with assistance from someone skilled in echo may be the only way to differentiate long-standing LVH from an acute ST elevation MI in someone with a hypertrophied heart. Benign early repolarisation. This is where the ST segments appear to ‘start early’ with an elevated J point at the point at which the QRS exits into the repolarisation phase that is the T wave. It can look very much like pericarditis. Note in the ECG below the apparent notching (best seen in V5 and V6) of the beginning of the ST segment, which is frequently seen in BER. ‘High-take off’ refers to a similar phenomenon where the anterior ST segments begin depolarisation at a different phase of the QRS. The concavity of the ST segment is also useful here, and the ST segments do not evolve, unlike those in acute MI. Ethnic variation. 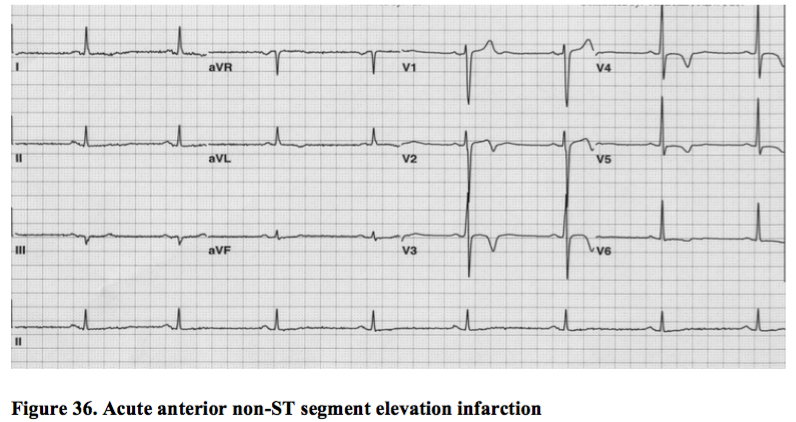 In some ethnicities, benign anterior ST elevation can appear more frequently on the resting ECG than it does in the Caucasian population. It has not been established whether this relates to postulated differences in LV mass, some other aspect of phenotype, or is simply an ethnic variant. 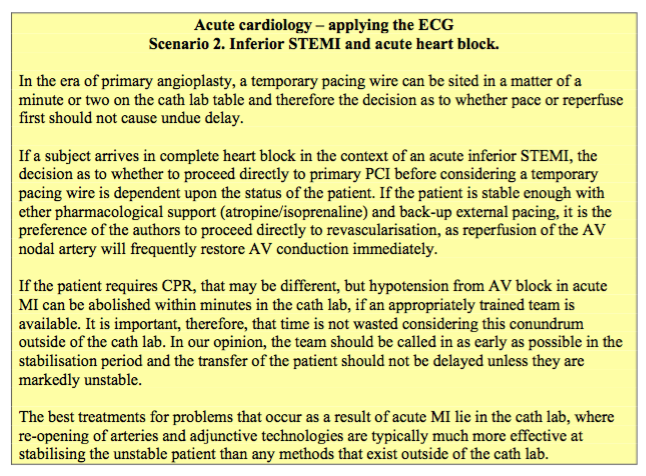 Heart block in the context of anterior STEMI is, unlike that of inferior MI, a high-risk scenario. It implies widespread damage to the septum and the sub-AV nodal conduction tissue contained within. Progression to asystole can be unpredictable and any degree of new heart block with anterior STEMI is one of the few occasions where a patient should be strongly considered for prophylactic temporary pacing. The circumflex artery is the principle supplier of blood to these two areas of myocardium and these are the sometimes the most difficult of the ST elevation MIs to spot and treat appropriately. The example above, however, is an obvious inferoposterolateral STEMI in a subject with a dominant circumflex vessel (i.e. one of the 10% of people whose circumflex also supplies the inferior border of the heart). Posterior ST elevation is represented on the standard 12-lead ECG by anterior ST depression. The ECG tends to evolve in a much smoother way than that of anterior ischaemia, which tends to be much more labile. 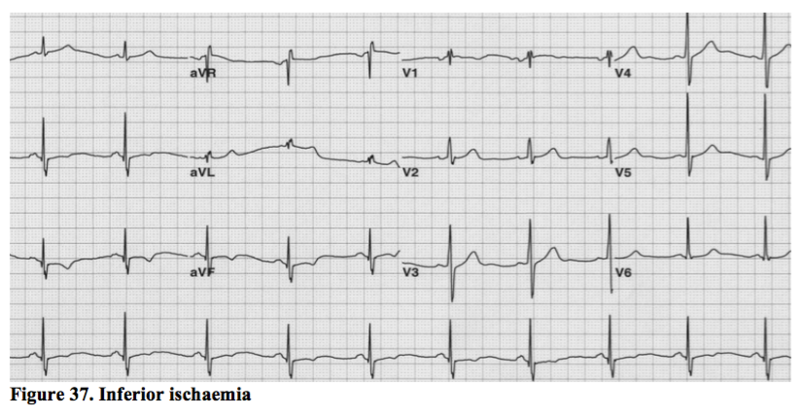 The history is also crucial for distinguishing the two, particularly if there is no suggestion of ST elevation present in other territories of the ECG to demarcate an occluded, as opposed to an ischaemic vessel. Three hours of continual pain is unlikely to represent an ischaemic vessel; rather, this represents an infarction from complete vessel occlusion. Distinguishing ‘reciprocal’ ischaemia in the LAD territory from posterior ST elevation can sometimes be tricky. Note the early dominance of the R wave anteriorly in V1 and V2 in the ECG shown above. This represents a q wave forming in the posterior wall, but on the standard 12-lead ECG, posterior wall findings are inverted as we are seeing it through the anterior lead positions. Posterior leads, sited in positions V7, V8 and V9 as a continuation of the traditional chest lead positions, would usually show ST elevation in this circumstance. 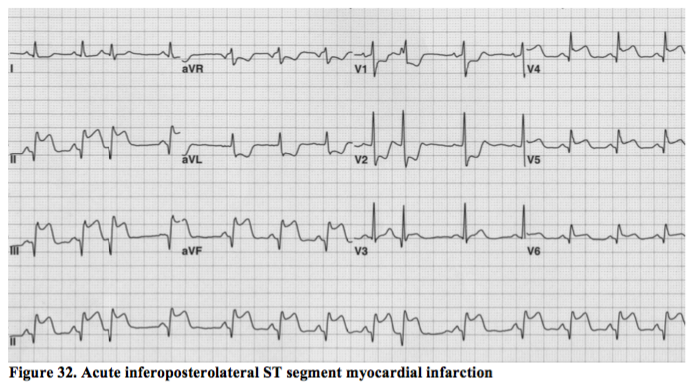 One millimetre of ST depression in two contiguous anterior leads on a standard 12-lead ECG may represent a posterior STEMI, which requires the cath lab, not a GTN infusion. This is a very difficult diagnosis to make and if you suspect it, you are advised to seek specialist help to avoid inappropriate treatment. An echo machine is sometimes the only way to be sure in a short space of time. 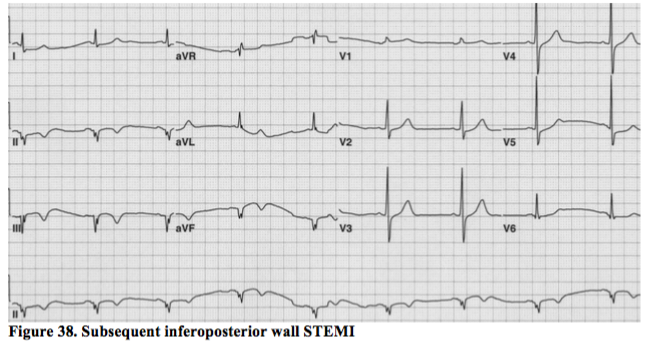 ‘High lateral’ STEMIs are seen in leads I and aVL. These are difficult to spot as the leads are not continuous. Here lies the concept of the ‘contiguous’ ECG segment – two leads looking at the same part of the heart without lying next to each other in a continuous fashion on the ECG. Again, 1mm of ST elevation in two leads is all that is required to trigger reperfusion therapy in the context of a reasonable history. 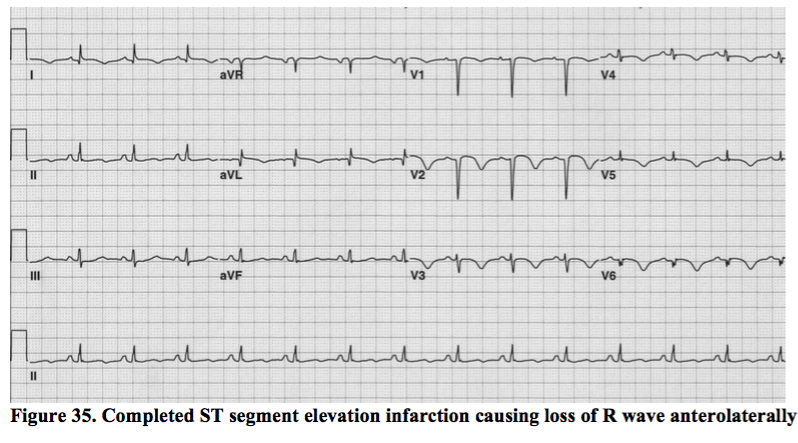 Frequently, however, high lateral STEMI does not even produce that, as seen on the ECG above. Relating the ECG to the patient and the history is once again crucial in this respect, even if it only saves a small amount of muscle, as appropriate reperfusion for high-lateral STEMI can reduce the chances of life-threatening arrhythmia. Similar ST elevation patterns may be seen in leads V5 and V6, but not always, as the limb leads look from above whilst V5 and V6 look from around the level of the apex. 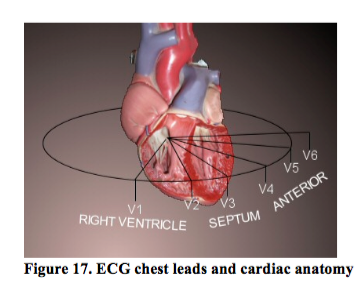 In Figure 32, leads I & aVL clearly look at a different part of the heart from leads V5 & V6 (though correct lead positioning on the chest may sometimes show involvement in the lateral leads which would otherwise be missed). The pathophysiology of unstable angina, non-ST elevation MI (NTEMI) and ST elevation MI is essentially the same. The surface of lipid-rich plaque becomes inflamed and then ruptures, exposing the fatty interior to circulating blood. Platelets are then activated and adhere to the exposed plaque. When this causes persistent total occlusion of the artery, STEMI occurs. When the artery is incompletely blocked with distal embolisation of these platelets, or when occlusion is only intermittent, unstable angina or NSTEMI occurs. Left unchecked, there is a high risk of unstable angina or NSTEMI leading to a full ST elevation infarct, as evidenced by the fact that whilst NSTEMI, historically, had a lower immediate risk, the risk over one year was very similar. The application of modern interventional and pharmacological measures has significantly improved matters in this respect. 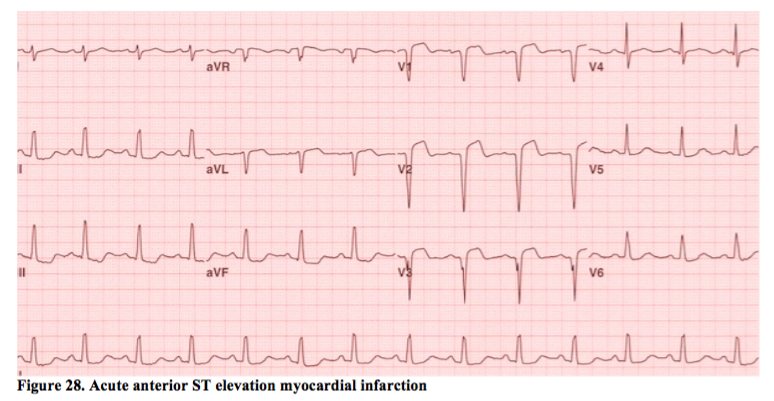 The ECG changes associated with NSTEMI differ from those with STEMI in one obvious way – the absence of ST elevation. 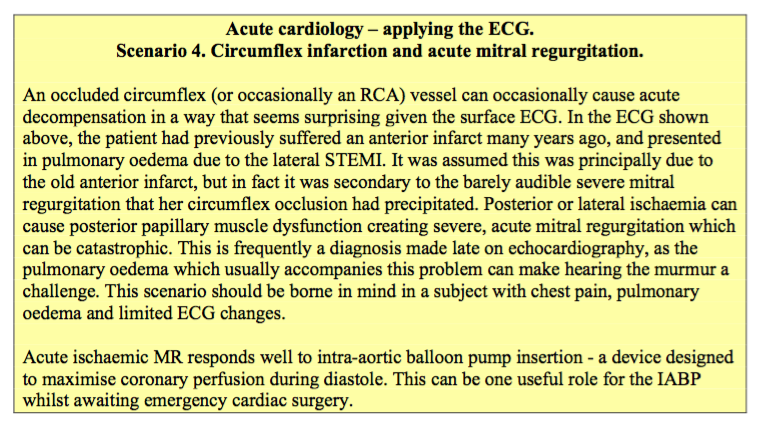 This can occur, however, when the ST elevation phase of an infarct is simply missed. The key differentiator on ECG is the preservation of R wave seen with NSTEMI, as opposed to the significant loss, or the q waves, seen with STEMI. The ECG below shows a completed anterior ST elevation infarct. Note the loss of R wave anteriorly compared to a normal ECG. Compare this to the anterior NSTEMI shown below. The T wave changes are similar, but the R wave progression from V1 to V6 is normal. This patient has had a temporary occlusion of their LAD, which the bodies’ natural fibrinolytic system has dealt with and only a partial thickness myocardial infarction has occurred. The bulk of the muscle in this territory remains normal, as evidenced by this subject’s normal echocardiogram. Angiography showed a 99% proximal LAD occlusion which undoubtedly would have been at risk of later complete occlusion. If that occlusion occurs outside of hospital, the mortality is over 30%. Unstable angina is a clinical diagnosis and not one made on the ECG alone. However, dynamic ST segment change at rest is a marker of high risk for patients with UA. The ECG below shows the first presentation to casualty of a patient with unstable angina. The inferior ST depression and T wave inversion was thought to be insignificant and the patient was discharged. 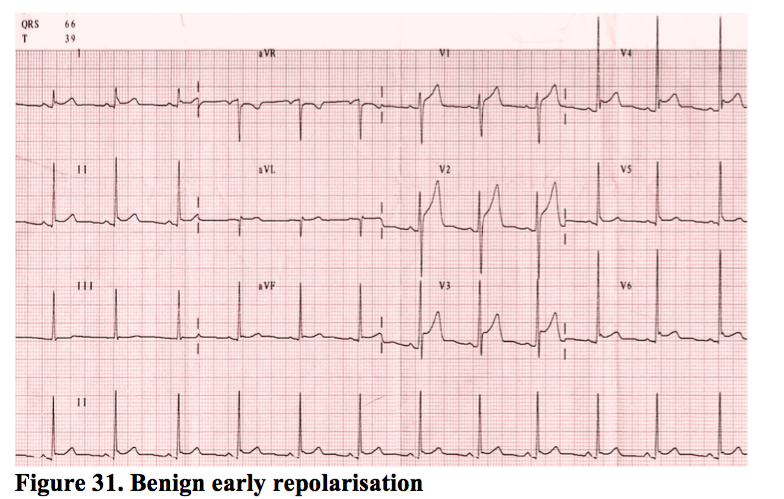 The wandering baseline of this ECG does not help, and the findings may have appeared more significant to the reader if a good quality ECG had been obtained. Nevertheless, the inverted T waves in all three inferior leads were abnormal and should have rung alarm bells. One could be forgiven for noticing the dominant R waves anteriorly which also likely represented a partial, old posterior infarction. The same patient re-presented two weeks later with recurrent pain and looked unwell (Figure 38 for ECG). Note the loss of R wave inferiorly representing a completed inferior STEMI. The inferior changes on the original ECG only pointed to localised inferior wall ischaemia, perhaps quite distal in the RCA. The fresh inferior infarction, together with the previous posterior wall infarction represented one third of this gentleman’s heart muscle and a lifetime of heart failure. Downsloping ST segment depression with pain, in a territory corresponding with a known section of coronary anatomy, is a high-risk marker of UA. Never ignore it or discharge that patient. NSTEMI is not NSTEMI if the R wave in that territory has been lost! Instead, this likely represents a completed STEMI and is treated differently. Lateral ST depression is difficult to interpret. 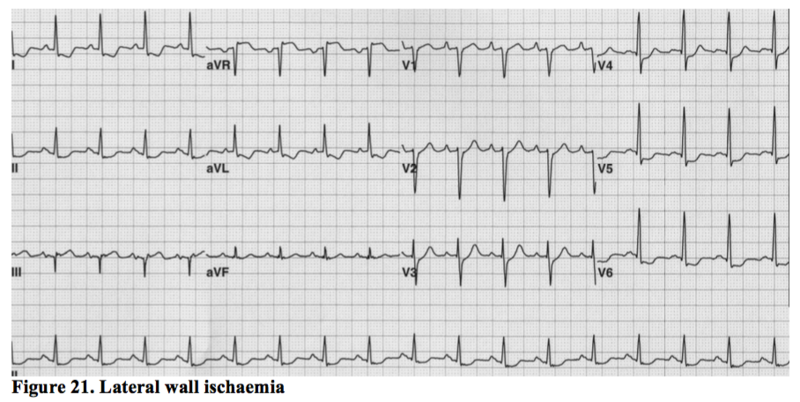 LVH can cause this, and is frequently downsloping, yet this does not mean the patient is ischaemic – merely that LVH has induced permanent changes in the ECG. Serial ECGs are required to ascertain whether these changes are significant, in conjunction with a thorough history and regular review of the patient in the first hour. As mentioned earlier, T wave inversion in aVR and V1 is normal, and may be normal in lead III. Some ethnicities are said to exhibit T wave abnormalities in leads V1-V3 as a normal variant, but this rule should be applied cautiously – it should be a ‘normal variant’ only through a process of exclusion of pathology.